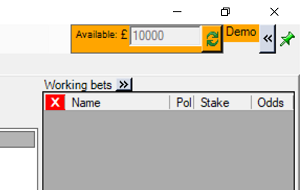 Training mode enables you to make simulated bets and practise using the software without risking real money. Real market prices and amounts available are displayed, for your simulated bets to interact with. Your bets will appear to join the queue and get matched in quite a realistic way. You must choose training mode from the login options window, before you login. You cannot switch to training mode after you have logged in. Training mode uses a simulated account balance to allow you to track your profit or loss in training mode. The software automatically remembers your training mode funds, so your progress is not lost even when you close the software. 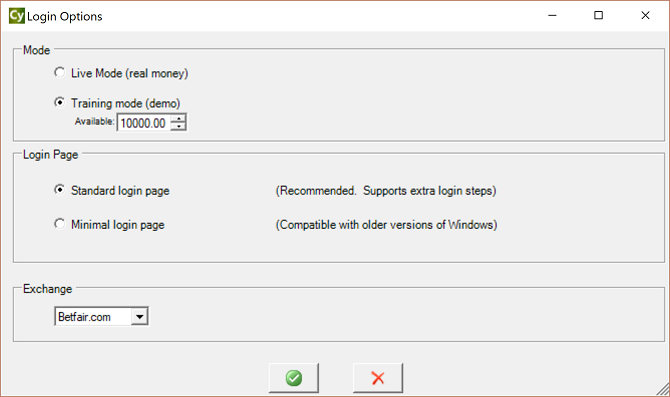 If you want to reset the value of the funds, then you can edit it on the login options window next time you login. When you submit bets in training mode, the displayed value of the funds available will change to mimic the exposure of real bets. It is not possible for the software to download the actual results of any markets, so you have to green up each market when you finish trading it to ensure that your simulated profit or loss is reflected in the account balance. If you do not green up, then the account balance will remain lower because the potential exposure of the bets will continue indefinitely. Please note that the persistence type of bets is not simulated in training mode (the 'At In-Play' setting is ignored). In other words, unmatched bets will ignore the 'Take-SP' and 'Cancel' options, instead they will continue to exist when market switches to in-play and will remain available for matching as if you had selected the 'Keep' option.